To call this Swiss outpost of the Kempinski hotel group “Le Mirador” is a bit of an understatement. The word “mirador,” or lookout, is the same term assigned to tourist-crowded platforms on Spanish roadsides, the kind where everyone piles out of the car to take snapshots of a silvery sea or a faraway horizon at sunset. That’s all well and good, but the “mirador” at this hotel is something more — it’s a jaw-dropper of a backdrop, a spectacle of nature that verges on the sublime. 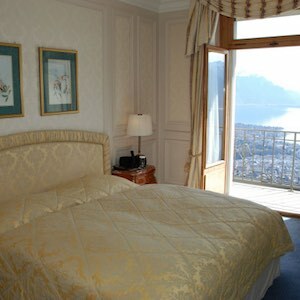 Switzerland’s like that, of course, especially on the perennially dazzling Lake Geneva. Le Mirador Kempinski is located on Mont-Pèlerin, overlooking the lake, amid vineyards that UNESCO has specially recognized. Somewhat surprisingly, especially considering the place features three restaurants and a Givenchy Spa, Le Mirador is not a large resort, but a rather intimately sized 61-room hotel. Standard guest rooms, housed in the older and more historic part of the hotel, are spacious, with private balconies overlooking the lake, king-sized beds, large flat-screen TVs, and iPod docking stations. The look is classic, not contemporary — think gold-flecked tapestries and sumptuous floor-to-ceiling drapery. Junior suites, in the hotel’s newer wing, have more of a modern look, plus natural stone bathrooms and more sizable terraces. The collection of suites are, in short, the kind of room you’ll be staying in if you happened to arrive at Le Mirador’s helipad instead of walking through the front door. Amenities vary — some have full kitchens, others carved-marble baths — but they have one thing in common. Views: that’s what you get at Le Mirador, no matter where you’re sleeping. Le Mirador is home to the only Givenchy Spa in Switzerland, not to mention an indoor swimming pool topped with a glass dome, a fitness center with panoramic views of the lake, and several tennis courts. There are also medical and dentistry centers (read: this is a place where the beautiful people come to work on staying beautiful.) Of the three restaurants, the most buzzed-about is the Michelin-starred Le Trianon. Nearby, the Piano Bar is spread across two spaces: an ornate salon with rich red carpeting and elegant leather armchairs, and a magnificent terrace overlooking the lake. It’s hard to picture a more impressive venue for sampling the region’s famous wines. Raise a glass of Chasselas and toast to your good health, and your good fortune: if you’re staying at this hotel, your life is going pretty well indeed.